Camping with your precious canines can be a highly enjoyable experience, but you do need to prepare for the trip and know some tips so that you and your dogs can have the most exciting and memorable time possible. 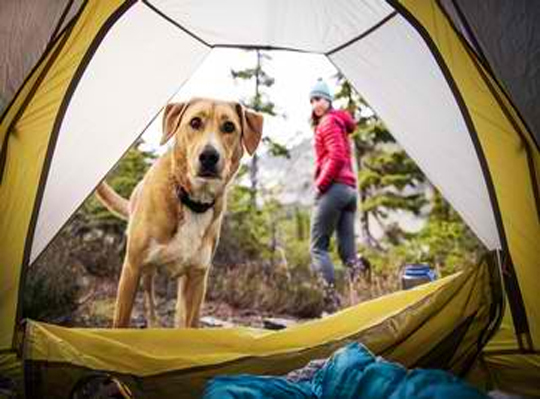 Dogs love the smells and the new adventures a camping trip offers. Most camping areas are dog-friendly, but you do have to adhere to the rules and regulations to protect your pet and other wildlife. Before you even begin the camping trip, be sure your dog(s) is current on all vaccinations and treatments such as tick, heartworm and fleas. You may want to pack some insect-repellent for extra protection. Tweezers, tick remover and grooming supplies are essential items for your dog when you’re camping – and an old towel comes in handy for muddy paws and/or rainy days and fun and games in the river, lake or beach. An embedded microchip is a good idea in case your dog is lost or injured. Be sure to bring that information as well as all medical records and license to have on hand if needed and if required by the campsite. Clean drinking water and a good supply of food – plus bowls to put them in – is a necessity for your pet. There are collapsible dog water bowls you can take on hiking trips so your dog won’t have to do without wherever you are. Travel mats for your dog to lie on have nylon, water-resistant backings and soft interiors that roll up for easy packing. And, don’t forget a stake and reflective cable on which you can tie the dog when necessary. When it’s time to do some hiking with your pet, be sure you have a collar and leash and know which trails in the area are dog-friendly. Don’t forget some doggie waste bags to take on hikes rather than leaving the mess for someone else to step in. Hiking can be hard on your pup’s paws, so consider doggie socks for protection. They also help to protect the paws on hot sidewalks and sand on the beach. If you’re going to be boating or enjoying romps into the ocean, be sure your dog has a flotation vest. Small dogs usually prefer to be in a crate when they’re at an unfamiliar location. They feel safer and it gives them a sense of home security. Dog packs are great additions to any trip so they can carry their own supplies. You can usually find them at any pet or camping store. Such extras like collar lights to help your dog see where he is at night and a Frisbee or favorite toy can help make the camping trip easy and fun for your dog and yourself. It helps him and you get plenty of exercise and enjoy the surroundings even more.